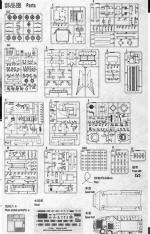 This adds to the excellent preview and review written on Hobby Boss’ 1/35 AAVP7A1 w/EAAK. The Assault Amphibious Vehicle Family of Vehicles (AAVFOV [AAVP7A1, AAVC7A1 and AAVR7A1]) is the currently fielded platform whose lineage dates to Donald Roebling’s 1941 Alligator. The Alligator was mass produced by the Food Machinery Corporation (FMC) and designated the Landing Vehicle, Tracked, Mk I (LVT-1). FMC continued producing LVT’s up thru the LVT7, with only two exceptions (LVT3 [Borg-Warner] and LVTP5/H6/E1/C1/R1 [Ingersoll] models). After proofing new concepts with the 1967 LVTPX12, the LVTP7’s 1973 fielding debuted new armor and water propulsion system for what became solely the Marine Corps’ LVT; the U.S. Army had owned and operated all previous models of the LVT. The LVT7 FOV supplanted steel for ballistic aluminum in its construction. Additionally, the new water-jet propulsion system, first tested on an LVTP6, rendered the vehicle’s track as a secondary means of propelling the vehicle thru water. By 1985 the myriad modifications saw standardization of the LVT7A1 thru a Service Life Extension Program (SLEP).The -7 FOV also received a modernization in terminology, becoming the Assault Amphibious Vehicle, there is no physical difference between the LVTP7A1 and AAVP7A1. 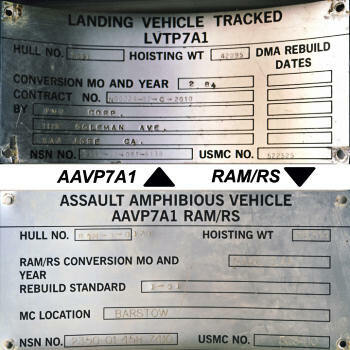 But, until the RAM/RS modification every AAV’s data-plate still identified the vehicle as an LVTP7A1. The pictured data-plate was gifted to me from an AAV I commanded from 1997-1999 before the vehicle departed for the RAM/RS rebuild line at Marine Corps Logistics Base Barstow. The data-plate is located on the port within the troop commander’s cupola. Throughout the 7A1’s service life, it has been subject to myriad modifications. The Upgunned Weapons Station (UGWS), Enhanced Applique Armor Kit (EAAK), SINGle Channel Ground Air Radio System (SINGCARS) modification, bow-plane and the drop-in MK154 Linear Mine Clearance (LMC) kit significantly strained, burdened and eroded the vehicle’s abilities. By the late 1990’s EAAK had been removed from all AAV’s (except those on MPF vessels and platoons deploying with a MEU) due to strain on the vehicle and excessive corrosion of the steel EAAK panels/plates. Necessity and finance proved the AAV7 FOV required an upgrade to remain sustainable and viable on the modern battlefield. Commencing in 1999 the Reliability Availability Maintainability / Rebuild to Standard (RAM/RS) upgraded AAV’s began replacing the AAVP7A1 at the Assault Amphibian Battalions. The RAM/RS provided commonality of parts with the Army’s Bradley vehicle, including engine, support arms, sprockets, road-wheels, idler-wheels, tension adjuster, and shocks. Although the vehicle’s overall weight had increased, so had its abilities. It was not until 2003 that the MPF assets were replaced with RAM/RS vehicles as RAM/RS AAVs were backloaded into the vessels vice the AAVP7A1s that had rolled out of them in support of OEF in preparation of OIF. The pictured data-plate was gifted in 2004, from an AAV departing for rebuild under the IROAN program. The AAV7 FOV has proved itself in Kuwait (Desert Storm), Somalia (being the last U.S. forces to depart the shores of that country) and Iraq (OIF). Unfortunately every clime and place the AAV has landed saw only three basic finishes, overall green, overall tan or the NATO green-brown-black camouflage. 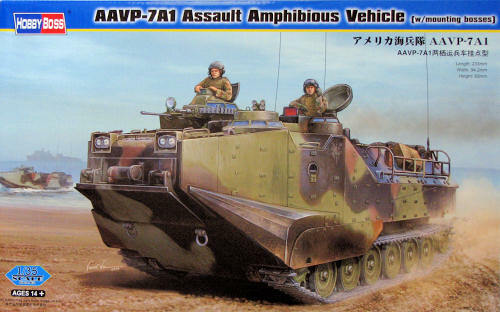 The only option for a more colorful AAV would be the several AAVs operated by the Amphibious Vehicle Test Branch (AVTB) in the late 1990s, having orange hatches, oversize white/black tac numbers, heavy weathering, one-off modifications and spots of different colors on various components. The AAV7 will remain and continue as the Marine Corps’ forcible entry from the sea capability until the Expeditionary Fighting Vehicle (EFV) is fielded. Even with initial fielding of the EFV, the AAV is expected to remain in service until 2025. Upon arrival the box was impressive, and peeling the lid off proved for even more impressiveness. The amount of detail contained in and on the parts will no doubt make for significant construction time. 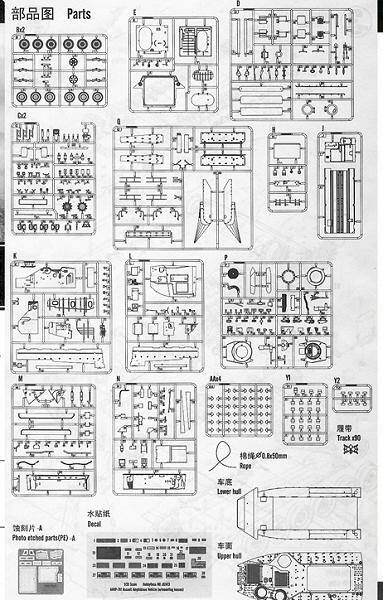 As I studied the parts I noticed several inaccuracies I will have to remedy once the AAV rolls onto my hobby desk. The photo-etch intake and exhaust grills provided with the kit do not replicate the real woven and welded grills very well. The grills can be replaced with Eduard’s AAVP-7A1 exterior detail (Item# 36079). During this time frame, there was a transition from the diamond pad track blocks to the “big-foot” blocks, AFV Club produces excellent after-market track sets for the AAV (item# 35133). 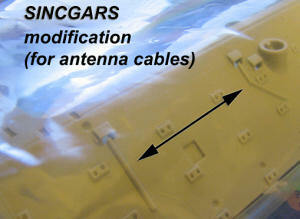 Specific surface detail narrow the service time of the AAV this kit represents to between 1995 and 2003. The upper hull has SINCGARS modification (pictured) but lacks the two additional bolt-on antenna mounts. Fortunately Hobby Boss accurately captured the usage of EAAK external storage racks (commonly referred to as gypsy racks) even when EAAK is not installed. When the AAV is on the ramp, and occasionally on exercises, the weapons are not mounted meaning there will be some hacking and carving to remove the molded in portions of the Mk19 and M2HB. Also, rarely are the headlights mounted, they are expensive and tactically compromising. The headlights were typically strapped atop the battery box (parts L12/L13), bolted against hull above the battery box or bolted to overhead directly behind aft engine compartment bulkhead. Moving to the interior, aside from exercises or operations with embarked infantry, center bench seats spend the majority of time mounted flush against the fuel cell. When mounted, the forward center bench seat rarely gets erected because it prohibits removal of the aft-lower engine panel. The generator, water pump, associated belts and voltage regulator reside behind this engine panel, along with the hoses and fixtures to conduct an emergency bypass of the cooling system if the contact cooler is damaged, all these components require frequent checks. When mounted though, there should be securing braces / buckles between each of the seat mounts (parts C1). Correctly captured, the area behind the radio cage (part K16) has empty radio mounts but, Hobby Boss did not include any radios. The SINCGARS radios and amplifier belong immediately behind the troop commander’s position (somewhat between parts C5 [rearmost] and N4/N7/N9). The SINCGARS modification also did away with the assistant-driver’s position (seat is part N23). As illustrated, two oil jugs (parts C39 and C40) are incorrectly positioned. The radio remote boxes (part C19) appear to be representative of the older radio system with a large switch instead of the digital toggle switched newer version. The instructions also do not indicate, although illustrated, that a remote box belongs in the troop commander’s station. The two cans closest to the starboard bulkhead should have their tops against or pointed at the wall, otherwise they do not fit against the slopping hull plate. The shackles are typically only mounted when they are needed (parts C8). The deck of the turret (part P1) should be mesh screen, not solid. The searchlight (part P15) is another component rarely used or mounted and would not raise eyebrows if it were missing. Unless operationally engaged or on the range 40mm ammunition chute (part P2) is rarely mounted but, will take some surgery to remove the portion of the part that is actually a piece of the turret. There are many .50cal ammunition cans represented in the kit but, this only occurs operationally (combat). If the full ammunition load was to be represented, Hobby Boss forgot to include the 40mm ammunition cans, which would be the taller 48-count cans which are stored beneath the port and starboard bench seats. The prominent square mold on the interior of the ramp (part E7) should be removed as it does not belong on the P7 variant, it is a vice mount on the R7 variant. Moving to colors, the Hobby Boss instructions is considerably lacking. The exterior can be finished in the three basic finishes, overall green, overall tan or the NATO green-brown-black camouflage but, for this time period the UGWS did not undergo rebuild when the AAV did. The turrets were usually more worn and either overall green or tan. The majority of the interior is commonly referred to as sea foam green but, pale green is a better match, and is semi-gloss in finish. The pyrotechnics can, which holds the red and white star clusters is usually painted red (part N5). The various air and heater hoses are orange (parts K1, M22, M24 and N1), even though the hose to the vehicle commander’s position (turret) is missing. The fire extinguishers (parts C23, C24 and N20) are in the standard bright red finish. The rubber fittings on the bilge pump tubes are usually blue (parts M20, M21 and M23). The tool box comes in all sorts of colors from green, red or blue (parts N8, N24). The personnel heater is dark green (parts N4, N7 and N9) and its attached tubes (parts K1, M5 and N15) are bare aluminum. The dome lights are usually white (parts C12) but, occasionally is the same color as the interior, with one green light (smaller) and one white light (larger) The Automatic Fire Sensing and Suppression Sensors (on parts M17) and control box (on part M2) is gloss white. The fuel cell straps should be chrome silver (on part K14) with flat-black edges. The 40mm ammunition cage should be shinny aluminum (part P26). Along with the engine panel edges, the myriad wires should be semi-gloss or flat black. The interior decks and inside of hatches should also be dark green. I know I will find more colors to add here and there as I build my AAV. The decals represent an AAV at the “school house,” Assault Amphibious School BN, indicated by the tactical number S6-6 (School, sixth platoon, sixth tractor). Modeling a different AmTrac would be easy, typically tactical numbers are painted on with six-inch stencils at 2D and 3D Assault Amphibian Battalions and is a five-digit alpha-numeric tactical number. Example: 3A309 would be “third tracks,” Alpha company, third platoon, ninth tractor. The decal representing what is an aluminum instruction plate on an AAV (decal 10) should be on the engine compartment bulkhead (directly above what is indicated), not on the engine compartment access panel. Overall this appears to be an excellent kit and am real anxious to commence construction on a representation of one of my previous “chariots.” I also plan to acquire the various other variants of the LVT / AAV that Hobby Boss is molding. Thank you Hobby Boss! Hopefully several of the many companies specializing in after-market kits will lavish some attention on the AAV7 FOV and produce the engine compartment, engine, transmission, cooling tower and several special mission kits including a litter kit and Mk154 kit. And if I am not asking too much, hopefully this spurs a kit of the LVT1 (in injection molding), LVT3 (still absent in kit form) the AAV’s imminent replacement, the EFV along with the Chinese ZBD.